In a market littered with corpses of would be consolidators, Speedcast has seen a 75% hike in sales following a recent acquisition. Its current price warrants a closer look. The market is littered with the corpses of over-geared, would-be consolidators that grew too fast and didn’t fully integrate acquisitions along the way. You needn’t even stray outside of the telco sector to find a recent and very public example in Vocus Group (ASX:VOC). You would therefore be forgiven for dismissing SpeedCast (ASX:SDA) as another roll up with a bloated balance sheet and little organic growth. For those unfamiliar with the business, SpeedCast is a global satellite services provider, operating in the maritime, energy, enterprise and government verticals. In November 2016, SpeedCast acquired one of its key competitors, Harris Caprock in order to create a leading position in the energy market, at what it viewed to be the bottom of the cycle in terms of earnings and activity. This doubled the size of the business, dramatically increased exposure to energy markets and required a ~$280m capital raising from shareholders. Eight months later SpeedCast announced another smaller acquisition to create a new government vertical, primarily to diversify earnings and capitalise on increased US government spending over the medium-term. Given the acquisition was debt funded, it implied gearing would stay elevated for another 12 months and that management had yet another execution hurdle to surmount. The stock has since de-rated as investors grow increasingly nervous about SDA’s gearing, execution risk and focus. All of these concerns are valid of course, but in our view these issues are clouding an exciting business on the precipice of major growth. Starting with the biggest area of concern, Energy, there has been a clear bottoming of activity. So far in CY17, second quarter earnings were flat on the first quarter and SpeedCast expect a return to marginal growth within the fourth quarter. 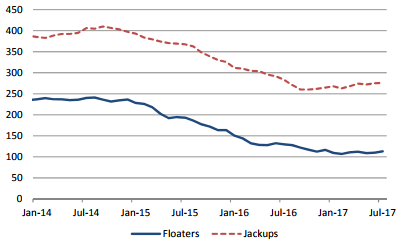 The primary clientele within this segment are operators of offshore oilrigs and hence a good indicator of future activity is the contracted global offshore rig count, which has begun to rise after a three-year decline. Meanwhile, its most recent acquisition, UltiSat, grew sales 75% in the first half of CY17, positioning it to exceed management’s original CY17 EBITDA forecast of $12m and more importantly, building an opportunity to make significant contributions to earnings in CY18 and beyond. This seems to be a feature of earnings growth that has been overlooked in the market, particularly with US government and defence spending increasing over the medium-term after several years of subdued activity. Yet most research notes are unwilling to forecast EBITDA from UltiSat above $12m in CY18, which would imply no (or negative growth), a far cry from its recent trajectory. This is not to mention UltiSat’s margins, which management believes could rise towards 20% under SpeedCast’s ownership. Another source of potential upside is margin expansion, driven by synergies and economies of scale. Management’s internal target is to lift group EBITDA margins to around 25% from the 21.4% reported in the first half. Like most in the market, we have not echoed this view within our own forecasts, but SpeedCast has shown its bargaining power with suppliers of satellite capacity, one of its primary costs, is rising in line with its scale. As capacity contracts throughout its various divisions roll over, it should be able to re-sign at lower costs, driving margin expansion. Should organic growth return in CY18 as management predicts, SpeedCast would have a number of earnings tailwinds that would see the stock return to material growth. 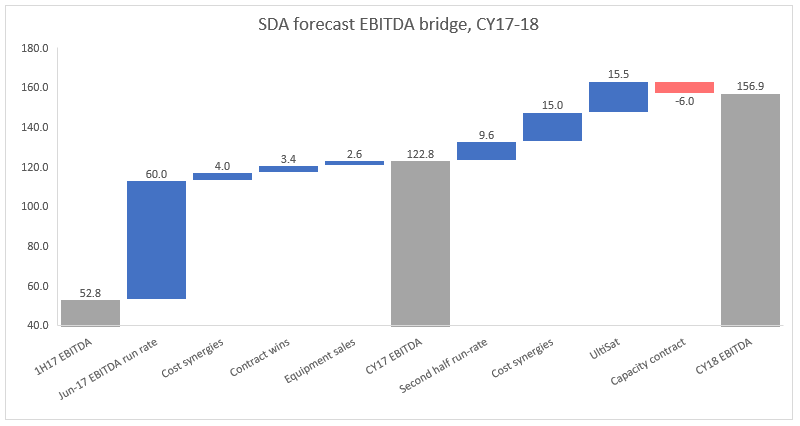 However, even without organic growth (outside of UltiSat) or margin expansion, we believe CY18 EBITDA could exceed market expectations, as illustrated in the bridge chart below. Finally, addressing the $330 million elephant in the room, SpeedCast will need to prove it can pay down debt over the next 6-12 months. Fortunately, it is a strong cash generator that should have upwards of $50 million in free cash flow (after dividends) to reduce its gearing. Management has forecast that gearing (measured as net debt/EBITDA) will fall from 2.8 times at the end of CY17 to less than 2.5 times in the first half of CY18. In our view, the market will need to see this occur as part of any re-assessment of the business. At current prices, we believe SpeedCast offers one of the best combinations of upside and value in the market. 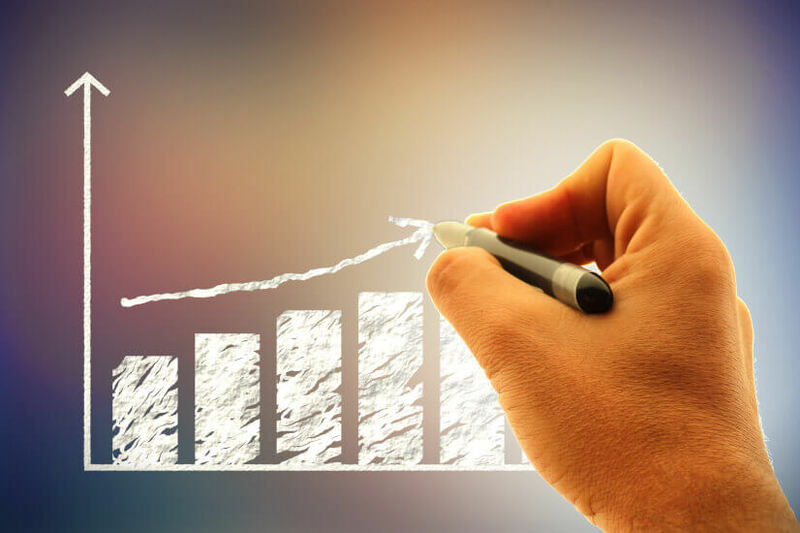 It is by no means perfect, as you will have gathered, but most of its issues should prove temporary, reflecting a business undergoing a transformational period in order to position itself for strong long-term growth. We estimate its worth to be somewhere between $4.70-4.90 depending on valuation methodology. For patient investors that trust management to execute, SpeedCast may be an attractive investment on a three-year view. Reporting season - how are companies faring against economic headwinds?